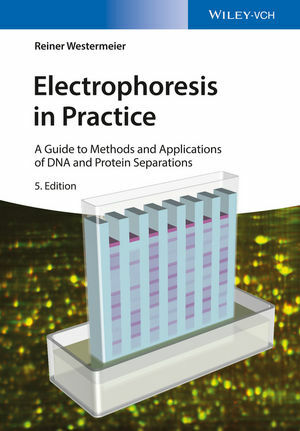 This fifth edition of the successful, long-selling classic has been completely revised and expanded, omitting some topics on obsolete DNA electrophoresis, but now with a completely new section on electrophoretic micro-methods and on-the-chip electrophoresis. The text is geared towards advanced students and professionals and contains extended background sections, protocols and a trouble-shooting section. It is now also backed by a supplementary website providing all the figures for teaching purposes, as well as a selection of animated figures tested in many workshops to explain the underlying principles of the different electrophoretic methods. Reiner Westermeier worked after PhD graduation and Post-doc at the Technische Universität München for 30 years as a specialist for electrophoresis methods for leading bioanalytics and biotechnology companies. His area of responsibility included co-operation in product development, writing of scientic papers and method instructions, trouble shooting in customer laboratories, performing seminars and practical courses on electrophoresis and proteomics, as well as giving scientific talks at congresses on a world-wide basis. He is editor and author of several books, e.g. 'Electrophoresis in Practice' (in German and in English), 'Proteomics in Practice', and 'Difference Gel Electrophoresis'.